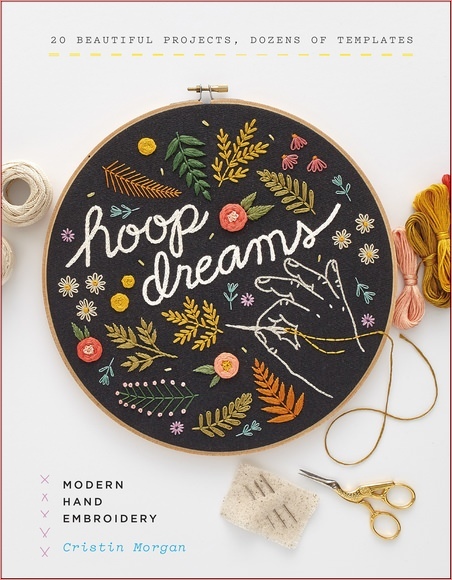 Vibrant color and rich textures abound in Hoop Dreams, a stylish embroidery guide for the modern maker. Author Cristin Morgan of Marigold + Mars outlines the basics of 10 classic embroidery stitches and then teaches you how to use them to create 20 beautiful and practical projects for hoops, for the home, and to wear.New and experienced embroiderers alike will be delighted by the fresh motifs and bold color palettes and empowered by the easy step-by-step instructions and templates, which show that with just a few simple stitches, some basic materials, and an idea or two, you can stitch just about anything. A glossary of more than 50 additional patterns and motifs will inspire you to personalize your projects and use your newfound embroidery skills in fresh and imaginative ways. As an added bonus, the book includes an envelope with 10 carbon transfer papers for quickly transferring patterns to fabric.